With mass spectrometry imaging (MSI) on tissue microarrays (TMAs) a large number of biomolecules can be studied for many patients at the same time, making it an attractive tool for biomarker discovery. 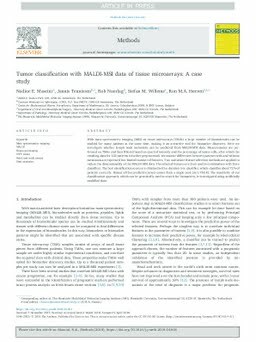 Here we investigate whether lymph node metastasis can be predicted from MALDI-MSI data. Measurements are performed on TMAs and then filtered based on spectral intensity and the percentage of tumor cells, after which the resulting data for 122 patients is further preprocessed. We assume differences between patients with and without metastasis are expressed in a limited number of features. Two univariate feature selection methods are applied to reduce the dimensionality of the MALDI-MSI data. The selected features are then used in combination with three classifiers. The best classification scores are obtained with a decision tree classifier, which classifies about 72% of patients correctly. Almost all the predictive power comes from a single peak (m/z 718.4). The sensitivity of our classification approach, which can be generically used to search for biomarkers, is investigated using artificially modified data.